King Balthazar, the Black King, must travel far to join the other Magi in their search for the Christ Child. Following the guiding star with his servant Saïd, he encounters hostile villagers and performs miracles along the way. 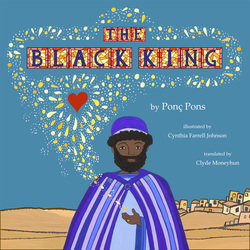 ​The Black King is a timeless tale of faith and charity in the face of intolerance and suffering. Written originally in Catalan, this translation is enhanced by vibrant illustrations that bring the drama to life in genuine Bible settings. Ponç Pons is an award-winning poet and fiction writer from Minorca, Spain. He writes in Catalan and has been translated into many languages. His other books for children and young adults include Basili the Dragon, Miquelet the Footballer, Dracula the Vampire, and Memorial of Tabarka. Clyde Moneyhun is the descendant of Catalan-speaking ancestors from Minorca, Spain. He translates the poetry of Ponç Pons, Dolors Miquel, and Maria-Mercè Marçal. His other translated children’s books include Ponç Pons’s Basili the Dragon and Maria-Mercè Marçal’s The Rain Song.